The Programmers Guide contains descriptions on the principles behind Service Oriented Architecture and Enterprise Service Bus, as well as how they relate to JBossESB. 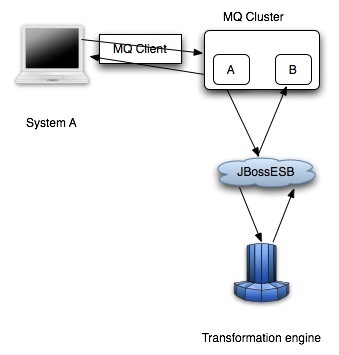 This guide also contains information on how to use JBoss ESB 4.0 Beta 1. Note: For the beta release, we recommend that you use this manual in conjunction with the trailblazer example, the user forum (http://www.jboss.com/index.html?module=bb&op=viewforum&f=246) and the javadocs associated with the code. This guide is most relevant to engineers who are responsible for using JBoss ESB 4.0 Beta 1 installations and want to know how it relates to SOA and ESB principles. 1. Chapter 1, What is SOA? 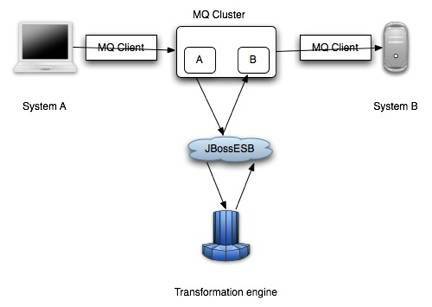 : JBossESB is a SOA infrastructure. This chapter gives an overview of SOA and the benefits it can provide. 2. Chapter 2, The Enterprise Service Bus: an overview of what constitutes an ESB and how JBossESB may differ from traditional ESB definitions. 3. Chapter 3, JBossESB core: a description of the core components within JBossESB and how they are intended to be used. 4. 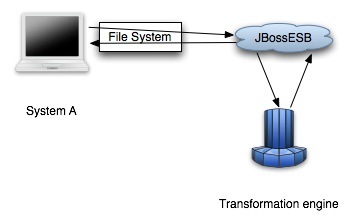 Chapter 4, Configuration: a description of the configuration options within JBossESB. A path to a function or dialog box within an interface. For example, �Select File | Open.� indicates that you should select the Open function from the File menu. 1. JBoss ESB 4.0 Beta 1 Trailblazer Guide: Provides guidance for using the trailblazer example. 2. JBoss ESB 4.0 Beta 1 Getting Started Guide: Provides a quick start reference to configuring and using the ESB. JBossESB is a Service Oriented Architecture (SOA) infrastructure. SOA represents a popular architectural paradigm for applications, with Web Services as probably the most visible way of achieving an SOA. Web Services implement capabilities that are available to other applications (or even other Web Services) via industry standard network and application interfaces and protocols. SOA advocates an approach in which a software component provides its functionality as a service that can be leveraged by other software components. Components (or services) represent reusable software building blocks. � There is an implicit (and sometimes explicit) lack of trust between the parties involved. � Business data is confidential and should only to be seen by the intended recipient. � Many assumptions of conventional middleware are invalid in cross-organizational interactions. Transactions, for instance, last longer - possibly for hours or days so conventional transaction protocols such as two phase commit are not applicable. 7. increasing revenue streams by easily making your own services available. � Cost Reduction: Achieved by the ways services talk to each other. The direct cost effect is delivered through enhanced operations productivity, effective sourcing options, and a significantly enhanced ability to shift ongoing costs to a variable model. � Delivering IT solutions faster and smarter: A standards based approach will allow organizations to connect and share information and business processes much faster and easier than before. IT delivery productivity is markedly improved through simplification of the developer�s role by providing standard frameworks and interfaces. Delivery timescales have been drastically reduced by easing the integration load of individual functionality, and applying accelerated delivery techniques within the environment. � Maximizing return on investment: Web Services opens the way for new business opportunities by enabling new business models. Web Services present the ability to measure value and discrete return much differently than traditional functional-benefit methods. Typical Total Cost of Ownership (TCO) models do not take into account the lifetime value generated by historical investment. This cost centric view destroys many opportunities to exploit these past investments and most enterprises end up building redundancy into their architecture, not out of necessity, but of perceived need. These same organizations focus the value proposition of their IT investment on a portfolio of applications, balanced by the overhead of infrastructure. An approach based on Web Services takes into account the lifetime contribution of legacy IT investment and promotes an evolution of these investments rather than a planned replacement. � Business analysts focus on higher order responsibilities in the development lifecycle while increasing their own knowledge of the business domain. � Separating functionality into component-based services that can be tackled by multiple teams enables parallel development. � Service Provider: A service provider allows access to services, creates a description of a service and publishes it to the service broker. � Service Requestor: A service requester is responsible for discovering a service by searching through the service descriptions given by the service broker. A requester is also responsible for binding to services provided by the service provider. � Service Broker: A service broker hosts a registry of service descriptions. It is responsible for linking a requestor to a service provider. Loose coupling does not require a mediator to route messages, although that is dominant ESB architecture. This is also a requirement within the JBI specification. The ESB model should not restrict the SOA model, but should be seen as a concrete representation of SOA. As a result, if there is a conflict between the way SOA would approach something and the way in which is may be done in a traditional ESB, the SOA approach will win within JBossESB. Therefore, in JBossESB mediation is a deployment choice and not a mandatory requirement. Obviously for compliance with certain specifications it may be configured by default, but if developers don't need that compliance point, they should be able to remove it (generally or on a per service basis). Note: Content-based routing is not supported in the beta release of JBossESB. � Process orchestration, typically via WS-BPEL. � Change management (hot deployment, versioning, lifecycle management). � Quality of service (transactions, failover). � Qualify of protection (message encryption, security). Many of these capabilities can be obtained by plugging in other services or layering existing functionality on the ESB. We should see the ESB as the fabric for building, deploying and managing event-driven SOA applications and systems. There are many different ways in which these capabilities can be realised and JBossESB does not mandate one implementation over another. Therefore, all capabilities will be accesses as services which will give plug-and-play configurability and extensibility options. In a distributed environment services can communicate with each other using a variety of message passing protocols. With the aid of client and server stub code, RPC semantics can be used to maintain the abstraction of local procedure calls across address space boundaries. Client stub code is a local proxy for the remote object, which is controlled by the corresponding server stub code. It is the responsibility of the client stub to marshal information which identifies the remote method and its parameters, transmit this information across the network to the object, receive the reply message, and unmarshal the reply to return to the invoker. However, SOA does not imply a specific carrier protocol and neither does it imply RPC semantics (in fact, loose coupling of services forces developers into an asynchronous message passing pattern). Therefore, multiple protocols should be supported simultaneously. In most cases, clients will know the communication protocol to use when interacting with a service; however, in some situations this may not be the case, and the communication stack may need to be assembled dynamically (via a hand-shake protocol, where the client stub may have to be dynamically constructed). At the core of JBossESB is a messaging infrastructure (MI), but this MI is abstract, in that it will does not force us into just JMS or SOAP styles. For example, a pure-play Web Services deployment within the ESB can be supported. As such, JBossESB assumes a single MI abstraction, but the capabilities may be provided by multiple different implementations. This is further support for the notion of having multiple buses within the ESB (each bus may be controlled by a separate MI implementation). Note: Support for the multiple bus abstraction will be available in the GA release of JBossESB. However, the beta release supports multiple messaging infrastructure implementations. The service description and service contract are extremely important in the context of SOA and therefore ESB. In general, the developers create the contracts and the ESB maps it to whatever technology is being used to implement the SOA, e.g., WSDL. JBossESB will allow this mapping to technology to be configurable and dynamic, i.e., it will support multiple SOA implementation technologies. Note: In the diagram, Processors refers to the Action classes within the core which are responsible for processing on triggered events. � Be easily configured to work with a wide variety of transport mechanisms (e.g., email and JMS). � Offer a general purpose object repository. � Enable pluggable data transformation mechanisms. � Provide a batch handling capability. � Support logging of interactions. 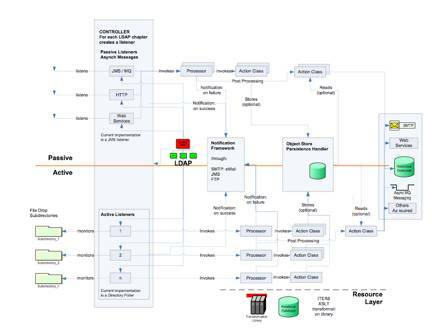 To date, Rosetta has been used in mission critical deployments using Oracle Financials. The multi platform environment included an IBM mainframe running z/OS, DB2 and Oracle databases hosted in the mainframe and in smaller servers, with additional Windows and Linux servers and a myriad of third party applications that offered dissimilar entry points for interoperation. It used JMS and MQSeries for asynchronous messaging and Postgress for object storage. Interoperation with third parties outside of the corporation�s IT infrastructure was made possible using IBM MQSeries, FTP servers offering entry points to pick up and deposit files to/from the outside world and attachments in e-mail messages to �well known� e-mail accounts. As we shall see when examining the JBossESB core, which is based on Rosetta, the challenge was to provide a set of tools and a methodology that would make it simple to isolate business logic from transport and triggering mechanisms, to log business and processing events that flowed through the framework and to allow flexible plug ins of ad hoc business logic and data transformations. Emphasis was placed on ensuring that it possible (and simple) for future users to replace/extend the standard base classes that come with the framework (and are used for the toolset), and to trigger their own �action classes� that can be unaware of transport and triggering mechanisms. � Event handling and process triggering/chaining using the Action and Listener classes, and the Notification framework. � Reusable data transformation libraries in public FormatAdapter classes. � A simple general purpose BusinessObject repository. A typical Rosetta deployment is shown below. We shall return to this diagram in subsequent sections. Note: Some of the components in the diagram (e.g., LDAP server) are configuration choices and although can be supported in the beta release of JBossESB, they are not provided. Note: The Processor and Action class distinction shown in the above diagram no longer exists in the beta release. Note: Some class and interface names may change between the beta release and the GA.
With the beta version of JBossESB, there is only a single implementation, the org.jboss.soa.esb.parameters.ParamFileRepository, which expects to be able to load the parameters from a file. The implementation to use may be overridden using the org.jboss.soa.esb.paramsRepository.class property. Note: In the beta release the Object Store configuration is handled differently. See the section on the Object Store for more details. � Provide persistency of data until all the currently known subscribers have successfully received the data. � Provide recovery of data to a subscriber; data can be resent from JBossESB as opposed to having to be resent from the publisher. � Provide historical data to a new or existing subscriber without having to go back to the publisher. Data is not stored in a manner to provide data mining or reporting capabilities. Stored entities are instances of the org.jboss.soa.esb.util.BaseBusinessObject class. The framework expects that all classes that extend BaseBusinessObject are able to serialize into a BobjStdDTO (data transfer object) and to have a constructor that takes a BobjStdDTO as the sole argument. The org.jboss.soa.esb.util.BobjStdDTO class is a specialized tree that has (among other methods) a toXml() method and a constructor that takes a valid XML string as an argument. The persistence interface uses BobjStdDTO as the argument to store, retrieve or replace objects in the store and is completely agnostic of the business class that the argument represents. Therefore, the store is able to deal with unknown user objects, as long as they are able to serialize to, and construct from, a BobjStdDTO, and that a proper entry is included in the object store's runtime configuration file. org.jboss.soa.esb.common.bizclasses.BatchProcess offers simple functionality to group a series of objects that are handed asynchronously to the org.jboss.soa.esb.services.IbatchHandler interface. You can initiate a new batch, add elements to the batch header, add batch, close and eventually commit the batch. The concept of batch strongly relies on the existence of the object store. The basic idea is to provide functionality to batch information that might reside in different sources and store all atomic elements in the object store until a trigger to commit the batch is received. When this happens, all the information resides within the framework and standard methods can be used to process it. The ability to store BaseBusinessObjects and BatchProcess in persistent media, provides a simple mechanism for decoupling successive steps in a chain of individual asynchronous processing steps. The object store uses a simple yet effective scheme that allows for storage of the serialized object (in the standard XML format), plus index information (Object�s UID, batch UID, timestamp, etc.) in a single SQL table (and as many SQL index tables as configured in the Object Store configuration class. Instances of classes that implement this interface represent the contract of the Object Repository service. Through the factory, implementation specific details of the contract are hidden. The location of the property file may be set through the org.jboss.soa.esb.objStore.configfile property. Every class stored in the repository is responsible for knowing how to serialize and deserialize itself from XML. The combination of BaseBusinessObject and BobjStdDTO classes are used to accomplish this. All instances of BaseBusinessObject are thus converted to and from the Date Transfer Object format (BobjStdDTO). It is this instance that is then responsible for converting to and from an XML representation. All classes derived from BaseBusinessObject that wish to be stored in the object store must provide a locator() method and may optionally provide a locator(int) method, as shown below. locator(0) is assumed to be the same as locator(). These operations provide indexing information for the object store searches using standard SQL queries. Note: The default implementation of locator returns a zero-length String array. Often clients and services will communicate using the same vocabulary. However, there are situations where this is not the case and on-the-fly transformation from one data format to another will be required. It is unrealistic to assume that a single data format will be suitable for all business objects, particularly in a large scale or long running deployment. Therefore, it is necessary to provide a mechanism for transforming from one data format to another. In JBossESB this is the role of Format Adapters, whose sole responsibility is data transformation. Note: In the beta release of JBossESB, Format Adapters are not a service or a component of the core: they are a pattern that we use within the core and recommend for users. This will be rectified in the GA release. Format adapters should be the only place that needs to be aware of coupling between different applications� representation of the same underlying entity. Note: Error handling code has been removed for clarity. � RDBMS table pollers (org.jboss.soa.esb.listeners.SqlTablePoller), email listeners, etc. Note: In the beta release of JBossESB, messages are represented as Serializable objects. This gives great flexibility over the content that can be exchanged between endpoints. However, it does mean that endpoints must be able to deserialize received messages. This means that classes representing message objects must be deployed within the application server. Action classes are responsible for doing the work requested (or implied) by the receipt of a message. As such, Actions are often implemented on a per-application basis, using the provided base classes (all in the org.jboss.soa.esb.actions package) AbstractFileAction, AbstractSqlRowAction and FileCopier, for working on file processing, SQL processing and file copying respectively. Actions that are also instances of BaseBusinessObject can perform transformations using the format adapters pattern, are triggered by Listeners and can provide operations to learn about the processing outcome. The DomElement contains configuration information that the AbstractAction may use at runtime. The Object is a reference to the current message. Both parameters are provided to the AbstractAction implementation at creation time. The processCurrentObject method is called to instruct the Action implementation to do some work. How often the method is invoked and how the work is performed is implementation specific: it is not mandated by the ESB. The getOkNotification and getErrorNotification methods are used by the underlying notification framework. They must be overridden by derived classes to return an application specific object to the recipient. They are frequently used to chain together sequences of interactions in a multi-step process. This implementation of AbstractAction is expected to be driven by a JMS listener and so receives an appropriate message format to deal with, which is passed in to the implementation during creation as one of the AbstractAction member variables (m_oCurr). In this simple example the body of the processCurrentObject method simply determines a random credit rating and uses this to initiate the creditScore. This score is subsequently returned when the notification infrastructure invokes the getOkNotification upon successful execution. sendNotification is responsible for sending the event/message represented by the Serializable parameter to the list of registered notifications (org.jboss.soa.esb.notification.NotificationTargets) which are represented in XML form by the first parameters (a serialized NotificationList). If no list is specified, then the registered targets are assumed to have been provided statically at deployment time via an appropriate configuration file. * to trigger that specific type of notification event. Currently supported implementations include (all in the org.jboss.soa.esb.notification package): NotifyEmail, NotifyFiles, NotifySqlTable and NotifyJMS (with two sub-classes of NotifyQueues and NotifyTopics). The sendNotification method is used to send the specified message to all registered targets. Messages of arbitrary content are provided through the Serializable parameter. These objects are typically provided by Actions using either the getOkNotification or getErrorNotification methods we discussed earlier. In the beta version of JBossESB the InotificationHandler interface is driven in the AS; the NotificationHandlerFactory returns a reference to an EJB. A consequence of this is that all URI attributes for the NotifyFiles implementation reference the file system as seen by the server (application server) that hosts the instance, as opposed to the client (the environment in which the listeners reside). Similarly, e-mails sent as a result of a NotifyEmail implementation will be sent by the server, so SMTP information used to send these mails is as configured for the application server (e.g., .../conf/jbossEsb.properties). Similarly for JMS messages (NotifyQueues, NotifyTopics) use queues/topics in the context of the application server that hosts the NotificationHandlerBean instances. Note: This is irrelevant when the client and server run in the same address space. The table below shows the various configuration options available for JBossESB Beta 1. Information concerning the various XML data structures needed to configure JBossESB are provided in separate documents. The principles behind SOA have been around for many years, but Web Services have popularised it. It is possible to build non-SOA applications using Web Services. Actually true asynchrony is often not necessary: synchronous one-way (void returns) RPCs can be used and often are in Web Services. Rosetta borrowed its name from the stone found in 1799 by French soldiers in the Nile delta�s town of Rosetta (French for Rashid) that was instrumental in Jean-Fran�ois Champollion deciphering of Egyptian hieroglyphs.